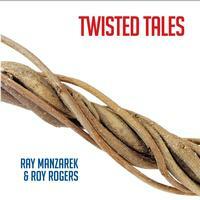 Roy Rogers is a slide guitar expert and Ray Manzarek was the keyboard genius behind the Doors. Together they produced a great album in Twisted Tales. It really does feel a lot like a cross between the Doors and a blues band. Of course, there was always a lot of blues band in the Doors. It should be noted that since this was recorded Ray Manzarek has passed away. That makes this an even more crucial recording to own. It’s quite good even without that information, though. This thing powers in with a real rock and roll meets blues vibe. Comparisons to the Doors are, of course, valid, but this has more of a real blues rock element to it than the Doors ever really pulled off. It feels more legit in terms of the blues. The guitar work is awesome and yet Manzarek’s keyboard magic was still intact here, too. There are some cool shifts and changes here and it gets quite powerful and dramatic at times. Even more pure blues rock, there’s a real honky tonk vibe to this. It’s bouncy and fun. It’s got some great slide guitar, too. It gets quite intense as it builds out towards the closing. As this starts it feels so much like some long lost Doors tune that it’s scary. The vocals change that concept, but this is a killer jam that should please just about any fan of Manzarek’s old band. The saxophone is a nice touch and at times this almost feels musically like Pink Floyd meets The Doors. There is a real Latin vibe to this thing. It’s a cool tune that rocks. A little jam mid-track almost feels like The Grateful Dead. This is quite a dynamic and diverse song. I’m not overly crazy about this tune. The vocals tend to be a little hard to take. The music is a little odd, but mostly catchy. The sax solo is good, though. This song is about eating disorders among other things. Sort of a mellower tune, this feels a lot like progressive rock or psychedelic rock. This little rocker is a lot like The Doors. It’s a tasty one that’s just plain fun. It’s also got some more of that smoking hot slide guitar. Here’s another killer rocker. It’s got plenty of that slide guitar. It’s also got some great Manzarek keyboard soloing. It’s another that has a lot in common with The Doors beyond just Mr. Manzarek. This comes in more like something from the Who perhaps. It works out from there into just more of a mainstream rocker. Here we get a bouncy sort of rocker that feels a lot like the Doors. This one is also a lot of fun. It’s got a real proggy edge to it and might be my favorite piece here. There is some killer saxophone on this thing really elevating it. There’s a cool little jazz jam at the end, too.